My off the head response was, the love and support of my family. That is true, but not the whole story. I think who or what inspires you is more about what you are doing at the time. In childhood, during the 1960’s, I wanted to be like Olympic Ice skaters Carol Heiss and Peggy Fleming. That was until a severe injury caused during practice on the frozen marshes of Saugus, Massachusetts ended that dream. I turned my attentions baseball and Rico Petrocelli. It didn’t matter to me that I was a girl. I never saw myself as a gender, but a person. I paid for many broken windows in my Saugus neighborhood, chasing that dream. By the time I entered high school in Pembroke, New Hampshire, I came up against my first true sense that being a girl mattered (at least in the schools mind.) I was told no girls allowed in baseball or golf. Softball was for girls, but not for me, I was too small and fragile. I may have looked fragile at 4 feet 9 inches and if I was lucky 90 pounds, trust me I wasn’t. I spent my summers working on my uncle and aunt’s farm and junk yard. My interested were being pulled in two directions, to be like Florence Nightingale or teach English like my favorite English teacher, Frank Jewett. Mr. Jewett knew how to capture your attention by using music to teach Iambic Pentameter. Music to William Shakespeare, who knew. Throughout this whole time my love of family stories and history never left me. I loved the time with my Great Aunt Carrie [Lulu Carrie Stearns Perkins,] listening to her stories about her rural life in Sutton; about who we were related to, like Queen Victoria. [I haven’t found that lineage, yet.] I was able to trace the Stearns lineage to the Winthrop Fleet 1630 arrival. Aunt Carrie would say, “We have deep roots in this county, girl. You are from founding families of this town. Be proud of where you came from. We are the salt of the earth. Farmers from way back. That may not mean much to some, that doesn’t matter, girl. We lived, had a family and made do with what we have. If you do nothing else but love and have a family, you have achieved something. 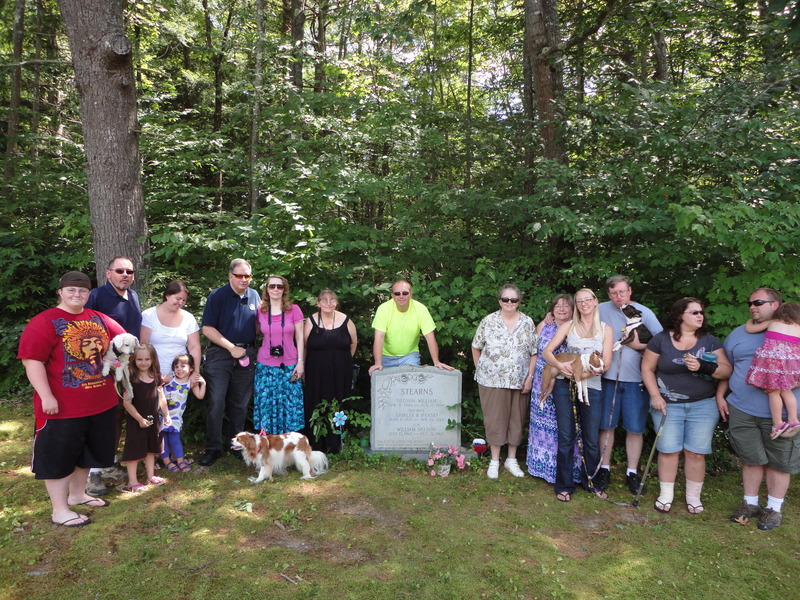 You keep the family going.” I was able to trace the Nelson lineage to the early years of Perrystown, now known as Sutton, New Hampshire, and even back to my ancestor, Thomas Nelson’s, arrival in the colonies about 1640 to Rowley, Massachusetts. That love of family and family history continues to this day. Aunt Carrie, my parents, Nelson Stearns and Shirley Pease Stearns, and my Aunt Eleanor Stearns Duncan, are no longer living to assist me through our history. Their stories, love and support still support me with their strong sense of FAMILY that that gave me. My family history deep roots of family inspiration, is guided by others now-a-days, like DearMyrtle, Cousin Russ, weekly Legacy Family Tree Webinars, television shows like Finding Your Roots, Who Do You Think you Are, DNA gurus, like Blaine Bettinger, and many other people in my genealogy circle of friends and family. All keep me inspired to continue the journey of my family story. Now, back to my original thought. My true inspirations is the love and support of my family. I would not still be here today without my husband, Michael D. Butka; daughter, Tyna M. Butka; son Michael J. Butka and the my siblings; Vickie M. Stearns Levesque Junkins, Marjorie R. Stearns Stevenson, Eleanor A. Stearns, Susan R. Stearns Aeschliman, Nelson N. Stearns and their families. their love, support, strength and constant reminder that I AM LOVED. It is that love and inspiration that carries me through each day of life’s challenges. Sources for this are my personal thoughts. Links to genealogy and DNA links are connected to those named.